Kölsch Beer is a great warm weather beer. 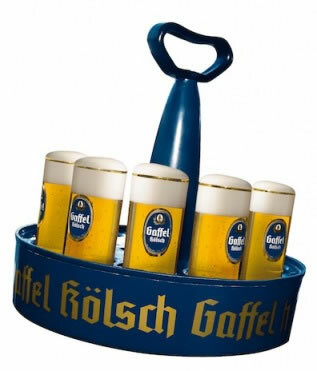 Here is a synopsis of its origin and the Kölsch Beer style. Kölsch Beer is top, warm fermented, pale golden ale. First called Kölsch in Köln (Cologne) Germany in the early 20th century. It’s still the dominant beer consumed in Cologne with about two dozen Cologne breweries producing the popular ale. Kölsch Beer was introduced as a competitor to the Plzen beer – a light lager – that was taking over the former ale market, when the tastes of beer drinkers drifted toward mild flavored and lighter colored brews. Filtered, producing a bright clear beer with a light to medium body. May have some fruitiness with mild bitterness, low hop aroma and a very slightly sweet taste. Traditionally served in a tall cylindrical glass called a Stange (Staan-gah) meaning “rod” or “pole” in German. This ale’s light and crisp tasting – perfect for hot weather. Kölsch is an easy drinking beer with an ABV of about 4.5 to 5%. In Cologne Biergartens, the servers (Köbes) carry it in a “Beer Wheel” (Kölschkranz). A mark is placed on your beer mat for each one served, creating a record for your tab. Kölsch Beer – enjoy and receive entertaining and informative articles with your free subscription of Black Bucket Brew e-Zine. Subscribe Now for your free emailed copy!